Barack Obama seems completely obsessed with systematically legalizing illegal immigration. The United States borders a failed narco-state that is one of the most crime-ridden nations on the entire planet, but Barack Obama refuses to secure the border and the consequences for the American people have been absolutely catastrophic. Right now it is already costing us tens of billions of dollars a year to provide welfare for illegal immigrants and to educate their children in our public schools. Right now illegal immigrants are already working millions of jobs that should belong to American workers. Right now Mexican drug cartels are already active in more than 1,000 U.S. cities. But apparently that is not good enough for Barack Obama. He wants to roll out the red carpet and give the green light to tens of millions more illegal immigrants. Last year, Obama issued a list of 19 factors for government officials to use when deciding whether to use "prosecutorial discretion" in deportation cases. In essence, under that new set of rules criminals and "national security threats" were to be deported and virtually everyone else was to be allowed to stay. But now Barack Obama has taken things to a whole new level. Now, if you are under the age of 30, came to the United States under the age of 16 and have lived here for at least five years you will be able to apply for legal status and a work permit. With the election less than 6 months away it is obvious that Barack Obama is pandering for votes. But this kind of "banana republic politics" is only going to divide America even more deeply and is going to result in some very serious pain for this nation in the years ahead. How close do you think officials are going to check to see if people applying for this new amnesty are really under the age of 30 or really have been in this country for at least five years? As I have written about previously, illegal immigrants lie to the IRS all the time. Every year they file hordes of fraudulent tax returns that result in them receiving 4 billion dollars in tax refunds that they are not entitled to. So if they are willing to even lie to the IRS, then why wouldn't they lie about when they came to the U.S. or about how long they have been here? For a long time Barack Obama has supported "sanctuary cities" for illegal immigrants, but now he has essentially turned the entire country into a "sanctuary city". Our immigration laws are still on the books, but everyone knows that Obama is not going to enforce the vast majority of them. And that is really sad. The United States will always need immigration, but the way that we do things today is really stupid. We make legal immigration an absolute nightmare, but we leave the back door completely wide open for anyone that wants to break the rules and come in illegally. So those that would like to come in legally and do things the right way are greatly discouraged from doing so while criminals, drug dealers, gang members, welfare parasites and those willing to survive in the underground economy are given the green light to come on over any time they would like. Our immigration system makes no sense whatsoever and now Obama has just made things a whole lot worse. In April 2008, the very popular, New Jersey Gov. Chris Christie, prostituted himself during a speech for votes at an event sponsored by the Latino Leadership Alliance of New Jersey by assuring his audience illegal aliens were not really here illegally, but were simply "undocumented." The 'unofficial' number of unemployed Americans is close to 25 MILLION. Those "undocumented" criminals Gov. Christie refers to are illegally holding 11.5 MILLION jobs that belong to Americans and naturalized citizens. Shame on you, Gov. Christie for thumbing your nose at our federal immigration laws and encouraging even more criminals to break into our country. Roll out the welcome mat. Unemployment in New Jersey is holding at a steady 9.3%. Gov. Christie apparently doesn't care if jobs go to illegal aliens instead of legal citizens in his state. After all, they're simply "undocumented". When you have a lot more workers competing for the same number of jobs, what happens? That is right - wages go down. We are seeing this happen in industry after industry. For example, several decades ago a roofer could live a nice middle class lifestyle and support an entire family on one income. But today that is no longer the case. So what has changed? A flood of illegal labor has entered the marketplace. Last year alone, the cost to taxpayers of LA County was whopping $600 MILLION dollars in welfare for children of illegal aliens. I guess it doesn't bother the people there getting fleeced in taxes to pay for all that welfare because they continue to elect governors who refuse to lock down the border and sympathizers of the invasion across the southern border of California to their legislature. Overall, it has been estimated that U.S. taxpayers spend $12,000,000,000 a year on primary and secondary school education for the children of illegal immigrants. In the sober reckoning of the RAND Corporation, for instance, the gross revenue that all Mexican cartels derive from exporting drugs to the United States amounts to only $6.6 billion. By most estimates, though, Sinaloa has achieved a market share of at least 40 percent and perhaps as much as 60 percent, which means that Chapo Guzmán's organization would appear to enjoy annual revenues of some $3 billion - comparable in terms of earnings to Netflix or, for that matter, to Facebook. News of cartel machinations are common in cities near the border, such as Phoenix, and the far-flung drug hubs of New York, Chicago or Atlanta, but smaller towns bring business, too. In unsuspecting suburbs and rural areas, police are increasingly finding drugs, guns and money they can trace back to Mexican drug organizations. The numbers could rise in coming years. The Justice Department's National Drug Intelligence Center estimates Mexican cartels control distribution of most of the methamphetamine, heroin and marijuana coming into the country, and they're increasingly producing the drugs themselves. In 2009 and 2010, the center reported, cartels operated in 1,286 U.S. cities, more than five times the number reported in 2008. The center named only 50 cities in 2006. These days a lot of Americans are being attacked (and sometimes killed) down in Mexico. American travelers to Mexico should beware of possible violent retaliation for this week's arrest of alleged Zetas drug cartel associates and family members inside the U.S., the U.S. State Department has warned. Though the warning does not specify which "Transnational Criminal Organization" might engage in "anti-American" violence, on Tuesday federal authorities arrested seven alleged associates of the powerful Zetas drug cartel in New Mexico and Oklahoma for allegedly laundering millions in drug profits through breeding and racing quarterhorses in the U.S. Those arrested included Jose Trevino Morales, the brother of Zetas leaders Miguel Angel and Oscar Omar Trevino Morales, who were also indicted but remain at large in Mexico. Fourteen dismembered bodies were found in a truck in the center of a town in northern Mexico on Thursday in what appeared to be the latest atrocity committed by rival gangs battling over drug-smuggling routes, local media said. The bodies of 11 men and three women were discovered in the sugar-cane farming town of Ciudad Mante in the south of Tamaulipas state, which borders on Texas, daily Milenio reported on its website. Overall, more than 55,000 people have been killed in drug-related violence in Mexico since 2006. Is that the kind of violence we want in this country? Already the region along the U.S./Mexico border is an open war zone. Just across the U.S. border, the city of Juarez, Mexico is considered to be one of the most dangerous cities on the face of the earth. In fact, Juarez is now the murder capital of the western hemisphere. But instead of strengthening security along the border, Barack Obama wants to make the border meaningless. When you tally it all up, bribery may be the single largest line item on a cartel's balance sheet. In 2008, President Felipe Calderón's own drug czar, Noe Ramirez, was charged with accepting $450,000 each month. Presumably, such gargantuan bribes to senior officials cascade down, securing the allegiance of their subordinates. "You have to recruit the high commands, so they can issue the information to lower ranks and order whatever they want," the corrupt cop, Fierro Méndez, testified. But in key jurisdictions, the cartel most likely makes payments up and down the chain of command. In a 2010 speech, Genaro García Luna, Mexico's secretary of public security, speculated that together, the cartels spend more than a billion dollars each year just to bribe the municipal police. What would you do if you were offered a bribe of $450,000 a month? Don't assume that Americans are so much more "moral" than the Mexicans are. Gang activity is absolutely exploding inside the United States. According to the FBI, there are now 1.4 million gang members involved in the 33,000 different gangs that are active inside the United States. The number of gang members in America has increased by 40 percent since 2009. Those stats should be very alarming to all of us. What are we going to do if gangs keep growing at this rate? According to federal statistics, gang members are responsible for up to 80 percent of all violent crimes committed in the United States every year. A very large percentage of these gang members have entered the United States from Mexico, but the federal government refuses to do anything to stop it. Thanks to illegal immigration, California's overstretched health care system is on the verge of collapse. Dozens of California hospitals and emergency rooms have shut down over the last decade because they could not afford to stay open after being endlessly swamped by illegal immigrants who were simply not able to pay for the services that they were receiving. As a result, the remainder of the health care system in the state of California is now beyond overloaded. This had led to brutally long waits, diverted ambulances and even unnecessary patient deaths. Sadly, the state of California now ranks dead last out of all 50 states in the number of emergency rooms per million people. Instead of looking out for the American people, many Democrats support legalizing illegal immigration because it will give the Democratic Party more support at the polls. This is incredibly selfish and self-serving, but this is the way that the political game is played in 2012. Amazingly, far more people move into the United States illegally than come in through the legal immigration process. As word spreads of the "Obama amnesty", millions more will come on over. After all, what would they have to lose? If they get caught crossing over they will just get nicely sent back and can try again in a few days. If they make it they can take advantage of all the free goodies here in the United States. Thanks to Obama, the odds of deportation are now very slim. And they can often make significantly more money in the "underground economy" in the U.S. than they can back home. 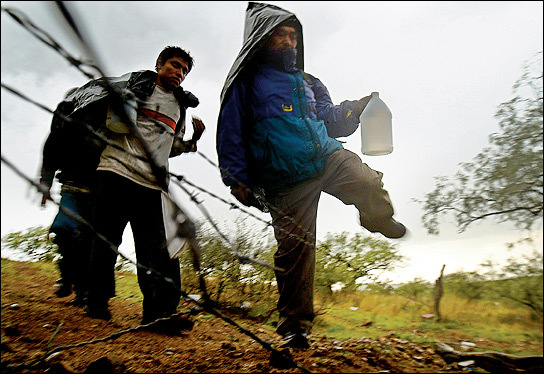 So what is the downside for illegal immigrants? Where is the pain? If you do get deported, you can always sneak back in. Security along the U.S. border with Mexico is a total joke. Sadly, many politicians on both sides of the border seem very pleased that the United States and Mexico are slowly but surely being integrated through illegal immigration. In fact, one gets the impression that Barack Obama would be quite pleased if the border between the United States and Mexico were to disappear completely. Politicians like Barack Obama don't seem to care about the catastrophic impact that illegal immigration is having on this country. They are absolutely obsessed with their social and political agendas and they aren't going to allow a few inconvenient "details" to derail them. Unfortunately, there is not much hope for significant change any time soon. Mexico is already a "failed state" and we are freely allowing millions of their bad guys to pour into our country. In the end, we will pay a very great price for our foolishness.